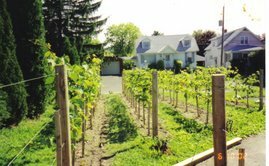 Backyard Vineyard & Winery: Let the Sun Shine! During and after verasion a winegrower becomes neurotically aware of the sunshine. My wife can't stand it because this time of year my moods are actually influenced by the weather report. When the forecast calls for warm sunny days, she loves me. If the dreaded cloudy, or worse yet rainy forecast is called for, however, she plans to spend time away from me! You see, this is the time of year when you need as much sunshine as possible to raise the brix(sugar content) of your grapes to adequate levels for wine making. For red grapes that is generally 22-24 brix and for white wine 20-23 brix will usually be sufficient. The sun does more than build sugar levels though. The sun shining on the clusters themselves actually contributes to something called phenolic ripeness. This means that not only do the grapes have sufficient sugar for wine making, but they are physiologically ripe. There are no vegetal flavors, harsh, green tannins are gone. Fruit flavors are at a maximum and the grapes will make delicious wine. It is entirely possible for grapes to have enough sugar, but still be unripe. That's where hang time comes into play. That is the difficult and subjective period when the grapes have achieved a fairly good level of ripeness but they are not quite ready to pick, so they must hang for days or weeks longer until they reach phenolic ripeness. During this time the birds, bees, deer and lots of other pests would love to get their greedy paws(beaks, antennae, whatever) on your precious crop. Again, this is where watching the weather is crucial. 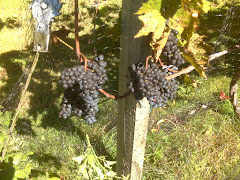 Nicely ripened grapes that are just about ready can be ruined by a soaking rain. The grapes will soak up the water and become diluted. They may swell and split open only to become infected by gray mold, sour rot or unwanted botrytis. This time period is so important and it's really exciting. The whole vintage comes down to these final weeks and you continue to hope for the best and try to avoid the worst. The most important decision is still more than a month away for me, that is the day to begin the harvest. 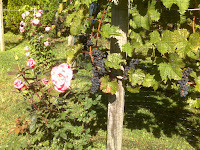 It will be different for each grape variety since they all ripen at different rates. It's all so stressful! And to think: I do this in my spare time for relaxation and pleasure? I need my head examined. The grapes look great! My mouth is watering just from looking at them. when the sun shine is one of the best parts of the day. I like a few the blog it is so interesting . How can you measure the BRIX levels?